Floriculture or flower farming is a branch of horticulture which comprises the cultivation of ornamental plant, flowering for pot plant, nurseries etc. It is the cultivation of flower and nourishes them with one goal in mind, the maximum production of flowers and flower buds. The main focus of farmers in floriculture is that they usually experiment new varieties to improve buds and flower developments. Global floriculture market is expected to flourish at a CAGR of 8.6% during the forecast period. Further, the market of floriculture is expected to garner USD 3.65 billion by the end of 2027. In recent years, Japan has the largest importers of cut flower from Vietnam. Increasing demand for cut flowers for personal use, occasions, gift purpose is expected to boost the growth of floriculture market. High quality flower type such as lily, orchids and roses captures the high demand in floriculture market. In the terms of regional platform, Asia Pacific dominated the overall floriculture market in 2016. Further, Asia Pacific region is expected to continue its dominance over the forecast period. This can be attributed to the high demand of cut flowers in the region. 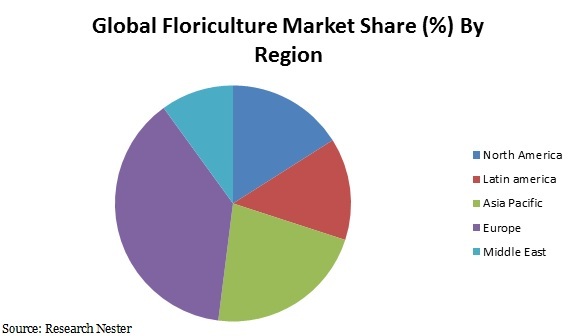 Further, rising government participation in the adoption of floriculture is expected to foster the growth of the floriculture market. Government is also providing high yield variety of seed and pesticides to promote the growth of floriculture in their respective countries. Asia Pacific is projected to witness significant growth over the forecast period. Increasing awareness of cut flower in the region is expected to swell the demand for floriculture during the forecast period. Additionally, China and India are expected to be the major contributor to the growth of the floriculture market over the forecast period. The market in Europe accounted for highest revenue share in the global floriculture market in 2016, and is expected to register a CAGR of over 5.9% between 2018 and 2027 owing to the increasing consumption of floriculture products in the countries such as Denmark, Netherland and Switzerland. Global floriculture market is entirely dependent on the awareness of cut flower in the global market where as it also comprises the personal disposable income of consumer who shows their buying behavior towards the cut flower industry. Country like India and China has the largest demand of floriculture market because of their festivals and occasion. High quality flowers are exported and imported from one country to another because of high demand. Growing population living standard is one of the key factors which are driving the market of floriculture market. According to USDA - National Agricultural Statistics Service Floriculture Crops Cut flowers are usually sold in bunches or as bouquets with cut foliage. The production of cut flowers is specifically known as the cut flower industry. Farming flowers and foliage employs special aspects of floriculture, such as spacing, training and pruning plants for optimal flower harvest; and post-harvest treatment such as chemical treatments, storage, preservation and packaging. In Australia and the United States some species are harvested from the wild for the cut flower market. At present, floriculture market includes some key strategy such as crop bedding, potting plant, partnership and crop investigation. Further, lack of awareness regarding the benefits in rural area is also expected to restrain the growth of floriculture market by 2027.